A recent post from Harvard Business Review on superficial chit-chat discussed the challenges of becoming friendly with co-workers. It begins: How often have you had the following conversation at work? This is a script “we stick to even if we are dying inside.” Such a script does little to develop friendships, and yet the article reveals some surprising stats: People who have a “best friend” at work are happier and healthier, and are seven times as likely to be engaged in their job. Those with friends at work have higher levels of productivity, retention, and job satisfaction. I see something more fundamental at stake than friendship. What if we viewed conversations as the source of our lives and living? We consume food to enhance our physical wellness. What if conversational diets shaped our attitude, wellness, and mental and spiritual experience? Try this. Notice when you are with someone who is whining or complaining about work or life. Are you left up or down, enlivened or drained? If there is a conversational diet what are its nutrients? To begin, let’s acknowledge that not all conversations are the same. Beyond their content is the meaning they convey. Whenever we chat, talk, or discuss with someone we are entering a minefield of meaning that can engage, enrich, inform, drain, or depress us. Let that sink in. Are you aware of your conversational diet and types? I offer four kinds of conversations found in our lives. I suggest we can shift the conversational diet we consume to share our experiences, enhance relationships, and even strengthen friendships. Idle Talk. This level of conversation is marked by reflexive or habitual small talk and responses. It is automatic prattle, much like the script at the beginning of this article. It includes gossip, weather, simple feelings (likes, dislikes), sports teams, TV shows, or casual items from the internet or news. Descriptive. This level of conversation includes sharing information or knowledge with details and specifics. It usually involves a desire to persuade or inform someone or to explore a topic together. Descriptive conversations are concerned with representing the facts of a situation and the world accurately. In most cases, these conversations clarify, engage, or understand transactions. Expressive. This level of conversation moves inward to reveal our self. It can be vulnerable, emotional, or affective. We share personal experiences, invoking an immediate experience in others: a closeness, bonding, or relatedness that can invite others to open up. These might include sharing a recent setback, a marital struggle, how a pregnancy impacts your sense of self, or how a new role challenges your self-perception. People who engage in generative conversations speak with intention. They issue calls, propose direction, or declare situations—all to engage others. They create change and generate action. These conversations are future-oriented: rather than complain about past events or speculate on current events, they act to engage the future. Take inventory of your daily conversations, as this will reveal your conversational diet. Most will be idle or descriptive as we respond to emails, make phone calls, and clarify information. When coordinating action, we may leap into generative language. Now, consider your time with colleagues. Do you remain habitually in idle talk or in descriptive conversations? These hollow calories lack nutritional value for meaningful nourishment. 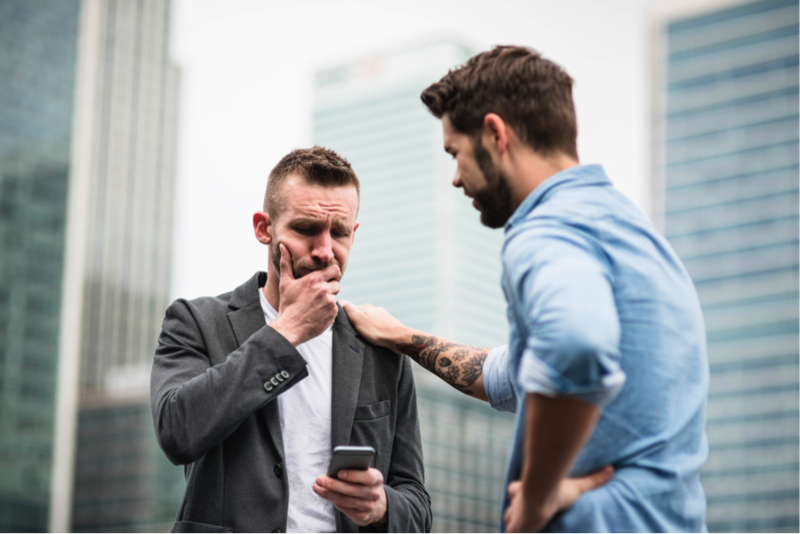 Do you risk expressive conversations that can let others in? And engage in action together to extend yourselves? Why do so many idle conversations show up for us to consume, and why is it you consume so many of them? What stops you from engaging with others beyond idle talk or descriptive conversations? Idle talk can serve as a form of social lubricant, much like an alcoholic beverage gets the conversation flowing. So then why don’t we ever get the conversation flowing? How long are you willing to grin and bear it? Avoid Idle Conversations: If you are consuming too many hollow conversations, cut these out or severely curb them. Notice who enlivens you, and cultivate those conversations. Upgrading conversations from idle or descriptive is a matter of intention. Whether in email, on the phone, or in person, ask yourself: What connections can I create, or why am I involved with this person? 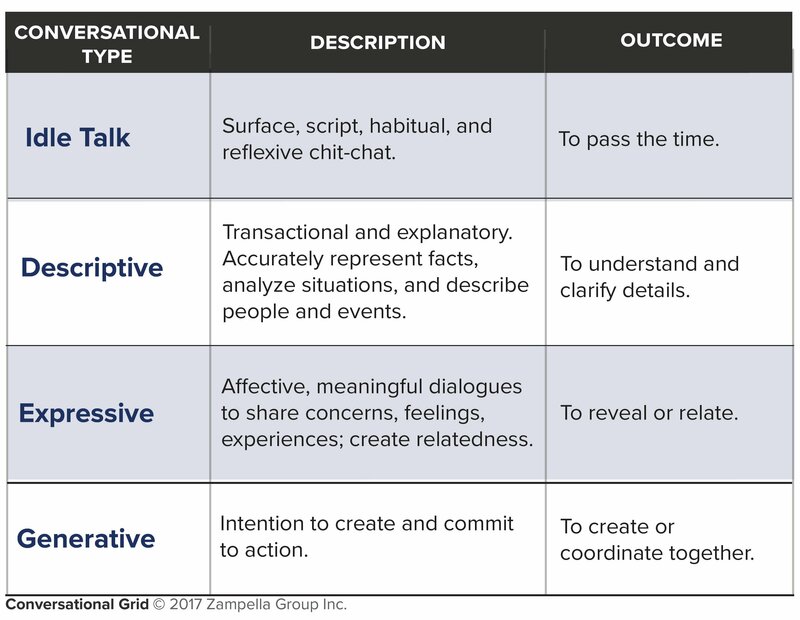 The following grids offer a framework to upgrade to expressive or generative conversations. Allow yourself to venture beyond scripts, be curious, ask questions, listen intently, and respond freely. See what happens. As stated above, the benefits of workplace connections are profound. We can create meaningful daily moments by being available for others, or having others listen to us—making it possible to release stress, relieve anxiety, and rejuvenate ourselves. Moving beyond our screens, “likes,” tweets, emojis, and idle talk to extend ourselves provides a human connection that offers vitality and creates important and lasting shared experiences. Moreover, it offers a nutritional mix to our conversation diet that expands our awareness and enlivens our humanity. This post is a complement to the following post: What’s Growing in Your Conversational Garden?